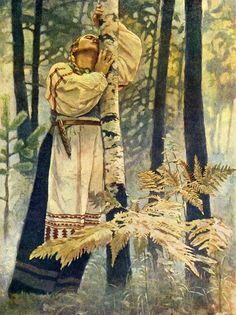 Aino is a Finnish heroine from the Kalevala, a long poem composed of ancient oral poetry that was compiled into an episodic whole by a 19th Century scholar named Elias Lonnrot. She was promised in marriage by her brother, an egotistical young man who challenges the older, wiser and powerful bard and shaman, Vainamoinen, to a battle of wits. He loses so badly that Vainamoinen is forced to rescue him and save his life. For this boon the young man Joukahainen offers him his sister. Aino, however, does not wish to marry Vainamoinen and while fleeing him comes to a body of water. She sees the Nakki, Finnish water sprites, playing in the water. She enters and drowns. Later Vainamoinen is fishing, disconsolate, and catches a salmon who taunts him, telling him she is Aino, but he will never possess her. With that she leaps back into the water. I actually did this painting last October in time for Fall Art Tour, but haven’t posted it until now. The location is Governor Dodge State Park, Wisconsin. Last summer we canoed around the lake with friend, Logan, who was very game about climbing over rocky banks and through bushes to reach the best fishing spots. It was a lot of fun as we maneuvered the canoe forwards and backwards, trying to find the best angles.